Conveyance was the issue of the afternoon at the February 23rd meeting of the Delta Stewardship Council as the Council first received an update on the California Water Fix project and then discussed the proposed Delta Plan amendment for conveyance, system storage, and the operation of both at their February meeting. On this coming Friday, March 24th, the Delta Stewardship Council will be holding a CEQA scoping meeting to cover this and other Delta Plan amendments. Coming up tomorrow, a presentation at the California Water Commission on this and the Delta levee investment strategy amendment. (Click here for more information on Friday’s scoping meeting). Don Constable, Environmental Scientist for the Delta Stewardship Council began with a brief history of the California Water Fix project, noting that it was formerly known as the Bay Delta Conservation Plan or BDCP. The BDCP was originally envisioned as a 50 year habitat conservation plan, but due to uncertainties, the approach was changed to a more traditional approach under state and federal endangered species act regulations. It is now known as Alternative 4A, or California Water Fix. A significant change between the BDCP and the Water Fix is that habitat restoration and the other conservation measures designed to improve the ecosystem are no longer included in Water Fix; instead, those are now under a separate proves called Eco Restore. Mr. Constable noted that the Water Fix now is primarily a conveyance project and while it includes environmental commitments that incorporate select parts of those conservation measures, it is certainly not the majority. Mr. Constable said this is relevant to the Council because the Department of Water Resources has indicated that this could be a ‘covered action’, in which case it could come before the Council. A ‘covered action’ is defined in statute by the Delta Reform Act; state and local agencies proposing to undertake a project or action in the Delta must certify to the Council in writing that their project or action is consistent with the Delta Plan. That self-certification can be appealed to the Council, and due to the controversial nature of the California Water Fix project, an appeal is virtually certain. He noted that another significant change between the BDCP’s Alternative 4 and the California Water Fix Alternative 4A are the operational scenarios that have been proposed. The operations under the BDCP utilized the decision tree, which had some hypotheses of how the project operations would affect fisheries and the flows would then be adjusted as needed, depending on the outcomes. The operations being proposed under the California Water Fix is similar to the BDCP’s operational scenario H3 but with an additional spring outflow component. An ongoing process is the change in point of diversion petition that is currently underway at the State Water Resources Control Board. In order to construct three new points of diversion in the north Delta, they need to obtain approval from the State Water Board. The process began on July 26, 2016. The hearing has been split into two parts; part 1 is further divided into part 1A and part 1B. This is important for the Council because the assumption is that DWR would not submit a certification of consistency to the Council before having a determination from the Water Board in getting a section 401 permit under the Clean Water Act. “If part 1 is delayed well into 2017, we could expect a further delay of part 2, and then after part 2, the Water Board could issue that determination, so we don’t know the exact timing on that, but I would expect at least late 2017,” he said. The other permits, the Clean Water Act 404 and 408 are unknown at this point in time. For the 408 permit, it’s common practice that to have at least 80-90% or 100% design in order to have that issued, he said. He acknowledged that the timelines on these permits aren’t quite clear. The project, as of earlier this year when they issued preliminary design, that was a 10% level design, so quite a bit would have to change. Mr. Constable reminded that the Council has previously submitted comments on the environmental documents; the comments addressed questions about the roles, rights, and responsibilities of specific agencies, the approach to adaptive management, funding commitments, and how to avoid or mitigate for impacts to recreation, agricultural users in the Delta, and the local communities. The Delta Independent Science Board also submitted comments, many which were the same as the Council’s. The science board also expressed concerns related to adaptive management. Mr. Constable noted that the final EIR does not really address adaptive management. He said it was his understanding that a plan was being developed and will be forthcoming. As of now, there isn’t a formal adaptive management plan to review. Staff has been looking through the 100,000 page EIR with assistance from Arcadis (consultant) to see how previous comments may have been addressed and to relate parts of it to Delta Plan policies. There will probably be an update at the May council meeting. Any new conveyance or storage project that meets the definition of being a covered action such as the California Water Fix will be held to the consistency criteria included in the Delta Plan, whose 14 regulatory provisions include requirements relating to siting of projects, local government consultation, a real and funded adaptive management plan to deal with changing future conditions, demonstration of reliance on the best available science, mitigation and where possible, and avoidance of local impacts. Ms. Pearson said the discussion draft is intended to be responsive to the legislative direction of 85304 in the water code; it is specific in promoting options and recommending the preferred characteristics of new and improved Delta conveyance, storage, and operations in order to address shortcomings of the current systems and to achieve state goals. She noted that the draft has been informed by hours of public comments at meetings, along with expert input which crystallized into the 19 principles adopted in December of 2015; it also reflects extensive staff and consultant review and policy level analysis of various conveyance, storage, and operational alternatives, plans, and environmental documents. Anthony Navasero, Senior Engineer, began by reminding that the Delta Reform Act of 2009 established the Delta Stewardship Council and charged the Council with developing, adopting, and implementing the Delta Plan, a comprehensive, legally enforceable long-term management plan for the Delta to meet the coequal goals. In April of 2015, the administration pivoted from the BDCP and split the effort into two alternative initiatives, the California Water Fix and California Eco Restore. Immediately afterwards, the Council began to take action and arranged a series of panels during the spring and summer of 2015, which consisted of subject matter experts and stakeholders to advise the Council on potential actions. The Council proceeded to take a two-step approach to adopt a guiding document and to develop a Delta Plan amendment regarding Delta conveyance systems storage and operations of both. In the winter of 2015, the Council adopted a problem statement and the 19 principles. The Council also sought and secured funds through a change proposal to hire consultants to assist Council staff, selecting a team from formerly MWH, now part of Stantec, to assist Council staff in the process to develop a draft amendment. Council staff not only presented the process and progress to developing a proposed amendment over 2016, but analyzed and evaluated authorities and options to understand the Council’s role in promoting options. Kari Shively (consultant with MWH/now part of Stantec) said they took the 19 principles that were adopted by the Council in late 2016, and used those to identify the key areas of focus for the conveyance, storage, and operations amendment. They also reviewed the 19 principles through the lens of existing state responsibilities and state authorities to identify the Council’s role as well as the role of different state agencies and local implementing agencies in implementing and moving forward with conveyance, storage, and operational changes. Using the problem statement that was adopted with the 19 principles are our starting point, they drafted a refined problem statement, which sought to really articulate to the key problems that are trying to be solved with the amendment. This format is consistent with how the Delta Plan is organized and drafted, where the different chapters start with a description of a problem followed by the identification of different recommendations or policies to solve those problems. And last, relevant performance measures were identified that could be used to track progress in conveyance, storage, and operations. PART 1: Introduction and problem statement provides the background on why the Council is amending the Delta Plan for conveyance, storage, and operations and the context for the amendment relative to achieving the coequal goals, as well as relative to other important state efforts, such as the governor’s California Water Action Plan. The introduction is followed by problem statements that articulate the challenges that are trying to be addressed with improved Delta conveyance storage and operations. Section 1 contains the recommendations related to conveyance. Item A describes the specific conveyance options that are being promoted; item B describes the characteristics or the analytical criteria that different project proponents really should be considering when they are evaluating different options for conveyance, and Item C describes the characteristics that should be considered for through-Delta conveyance. Section 2 contains recommendations related to new and improved water storage. Item A describes these specific water storage options that are being promoted. These options could be located in the Delta watershed, in the water export area for the Delta, or it could include on-stream and off-stream storage, groundwater storage. Item B describes the characteristics and the analytical criteria that project proponents should be considering when they are evaluating new storage projects. Item C describes some specific recommendations related to groundwater. Section 3 has the recommendations for improved operations. 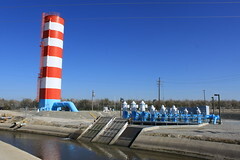 Item A describes the options that are being promoted for operations which focus on the coordinated operations of the State Water Project and the Central Valley Project under a range of different hydrologic conditions and how the system can be more flexible and resilient in the face of our ever-changing hydrology; it also identifies the promotion of certain storage and conveyance operations outside the Delta to encourage greater regional self-reliance. Item B describes important considerations for development of operations plans for any new storage and conveyance facilities. Item C makes recommendations to the Water Board for their consideration in updating the upcoming Bay Delta Plan. Item D contains recommendations related to the facilities outside the Delta that could also help achieve the coequal goals. Item E contains recommendations related to data management and transparency specific to the Dodd Act. PART 3: The third section identifies some refined performance measures that would be used to track progress related to conveyance, storage, and operations which are part of a larger body of refined performance measures. Cassandra Enos-Nobriga then noted that the scientific findings to support the amendment, which are attachment 2 and attachment 4 of the staff report. The Delta Science Program prepared the Delta Plan Summary and New Scientific Findings for Delta Plan update on storage, conveyance, and operations in October 2015. Since that time, additional scientific studies have occurred and new findings have been made and new reports have come out, particularly related to climate change and groundwater storage; that is a separate report called Updated Scientific Findings for Delta Plan Amendment concerning Conveyance, Storage, and Operation, Feb 2017. These reports were used to support the development of the current amendment. Ms. Enos-Nobriga concluded by noting that this is an initial discussion draft developed by staff and probably the first of three or more drafts of the amendment. There will be public workshops to gather feedback, which they will use to develop a second draft of the amendment that they will bring to the Council at the next Council meeting. They will also be having a CEQA scoping meeting. The intent is to come back in April for a third draft and request the Council to approve that to begin the CEQA process. Council Chair Randy Fiorini asked how they have coordinated with the Water Commission related to their Prop 1 storage funding, their guidelines, and their ecosystem requirements as per the Prop 1 water storage regulations. Councilmember Ken Weinberg suggests that there be more discussion in the problem statement about the status quo and the sense that we’re talking about conveyance, storage, and operations because if we don’t do something to enhance those three things, conditions are going to deteriorate for both of the coequal goals. “Even though this is part of the Delta Plan as a whole, people are going to be reviewing this kind of on its own like a standalone document, so it’s better for the public to understand why we have to take some action,” he said. Councilmembers Susan Tatayon and Mike Gatto also have questions about certain provisions of the document. Councilmember Pat Johnston notes that the amendment is mostly about one of the coequal goals and thinks it should address how improved conveyance will help the ecosystem. “We should be prepared to write what the case is for an environmental improvement, not just a mitigation necessity,” he said.